Abstract The detection of focal eosinophilic inflammation by non-invasive means may aid the diagnosis and follow-up of a variety of pulmonary pathologies. All current methods of detection involve invasive sampling, which may be contraindicated or too high-risk to be performed safely. 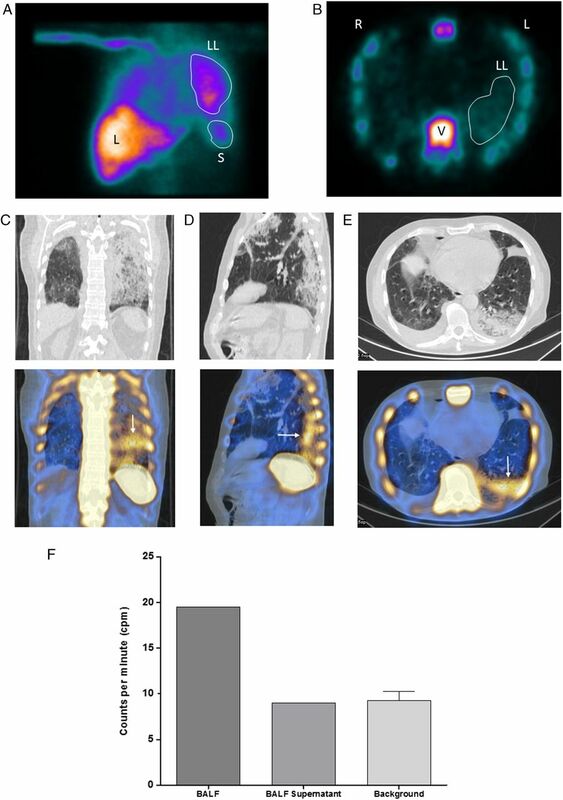 The use of injected autologous technetium-99m (Tc-99m)-labelled eosinophils coupled to single-photon emission computed tomography (SPECT) has been demonstrated to localise eosinophilic inflammation in the lungs of a patient with antineutrophil cytoplasmic antibody-positive vasculitis. Here, we report on the utility of this technique to detect active eosinophilic inflammation in a patient with focal lung inflammation where a biopsy was contraindicated. Tc-99m-labelled autologous eosinophils were prepared using anti-CD16 microbeads as described previously.2 Tc-99m-eosinophils (192 MBq) were injected and dynamic gamma camera imaging commenced, followed by SPECT; a single low-dose CT to enable anatomical alignment was performed. Within 5 min, uptake of labelled cells was visible on planar images of his left lung (see figure 1A) in addition to the expected physiological uptake in the liver, spleen and bone marrow. Increased activity was further demonstrated in his left lung on cross-sectional SPECT (see figure 1B). Coronal, sagittal and transaxial SPECT/CT images indicated focal uptake of radiolabelled eosinophils in regions of the lung corresponding to abnormal areas on CT (see figure 1C–E). These results provided evidence of pulmonary eosinophilic inflammation and supported the early use of high-dose oral corticosteroids, which led to rapid clinical improvement. The patient's serum on the day of the SPECT was analysed using a multiplex cytokine and chemokine array (MSD MULTI-SPOT Array System) and showed raised levels (pg/mL) of interleukin (IL)-5, 2.2 (NR <0.62 pg/mL), IL-15, 5.6 (NR <3.01 pg/mL); eotaxin, 428 (NR <145 pg/mL), eotaxin 3, 130 (NR <8.73 pg/mL) and monocyte chemotactic protein-4 (MCP-4), 358 (NR <117 pg/mL). (A) Reframed composite image of the first 5 min of the dynamic planar gamma camera scan. Increased 99m-Tc-eosinophil uptake is visible in the left lung. LL, left lung; L, liver; S, spleen. (B) Transaxial single-photon emission computed tomography (SPECT) image showing increased activity in the vertebra and left lung (LL). L, left; R, right; V, vertebra. (C–E) Coronal, sagittal and transaxial sections through the lung. SPECT/CT (lower panel) demonstrating focal 99m-Tc-eosinophil uptake in areas of abnormality in the CT (upper panel), (white arrows). (F) Raw gamma counter results showing increased counts in the bronchoalveolar lavage fluid (BALF) compared with the BAL supernatant and natural background counts. Within 48 h, his oxygenation had improved, allowing bronchoscopy. The bronchoalveolar lavage fluid (BALF) obtained had double the radioactive counts per minute (cpm) (19.5 cpm/mL) than the control fluid (phosphate-buffered saline) (9.3 cpm/mL) (see figure 1F). Counts in the supernatant (9 cpm/mL) after centrifugation were identical to the control, demonstrating that the radioactivity detected in the BALF was cell associated. The patient made a rapid and complete recovery following treatment with oral prednisolone. This case demonstrates the ability of Tc-99m-eosinophil-SPECT/CT to confirm pulmonary eosinophilic inflammation in patients where acquisition of BALF or lung biopsy was contraindicated. This methodology has the potential to be used clinically alongside or as a non-invasive alternative to conventional methods of detecting parenchymal eosinophilia. It may also aid in the translation of novel therapeutics by providing a platform to test their efficacy in reducing tissue eosinophilia. The authors thank all the staff at the Department of Nuclear Medicine at Addenbrooke's Hospital and the Wellcome Trust Clinical Research Facility, Cambridge; Cambridge Biomedical Research Centre Core Biochemistry Assay Laboratory; and the National Institute for Health Research, through the Comprehensive Clinical Research Network. CL and NF are joint first authors. Funding This work was supported by Asthma-UK (08/11), the Medical Research Council (grant number MR/J00345X/1), the Wellcome Trust (grant number 098351/Z/12/Z), and Cambridge NIHR Biomedical Research Centre. Ethics approval Written informed consent was obtained in accordance with the Declaration of Helsinki. The study was approved by Cambridgeshire Research Ethics Committee (09/H0308/119) and the Administration of Radioactive Substances Advisory Committee of the UK (83/3130/25000).